I’m not one to lecture others about how to drink whisky. Consume it how you like, I say. But if you’re going to drink whisky to appreciate it, I personally find it helps to have some consistency in the language used to describe the liquid. In fact, regular readers might have noticed that, over the past year especially, I tend to use some common words within my tasting notes – and so I thought I’d share why that’s the case. After I completed the Gordon & MacPhail whisky course (with the University of the Highlands and Island), I properly revisited my approach to writing tasting notes. I went on the course mainly for a bit of fun, but also so I could see a more formal interpretation on how to appreciate whisky. I was open-minded and this proved a proper eye-opener (in fact, the course is very good indeed). Though I won’t go into detail, for the tasting part of the course there was a fair bit of analysis of the degree of specific compounds within whisky – such as Phenolic, Sweet Associate or Aldehydic – all by way of the flavours you could identify. I enjoyed this consistency to tasting, and the framework it provided when comparing whiskies. Since then I’ve developed my approach to tasting whisky a little further, and I now often use one or two of following flavour wheels and charts. Some of them were originally published in Whisky Magazine and developed with the great Charles MacLean. On any of these, simply click the image for more detail. This is essentially what it says on the tin – a range of descriptions used to indicate the colour of a whisky. Whether it’s been in second-fill Bourbon casks, first-fill Sherry casks, or even virgin oak, these descriptions give a bit of a baseline when I look back over my notes. This is magnificent. A version of this was originally developed in 1970s by Pentlands Scotch Whisky Research, and then the pictured was later developed by Charles MacLean. 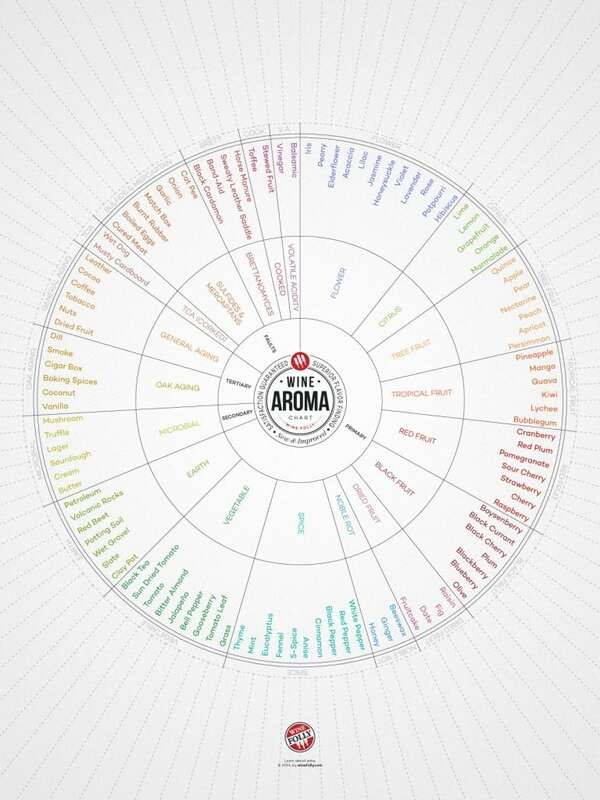 It “reflects the development of aromatics during production (sections 1-6) and maturation (sections 6-8)”. 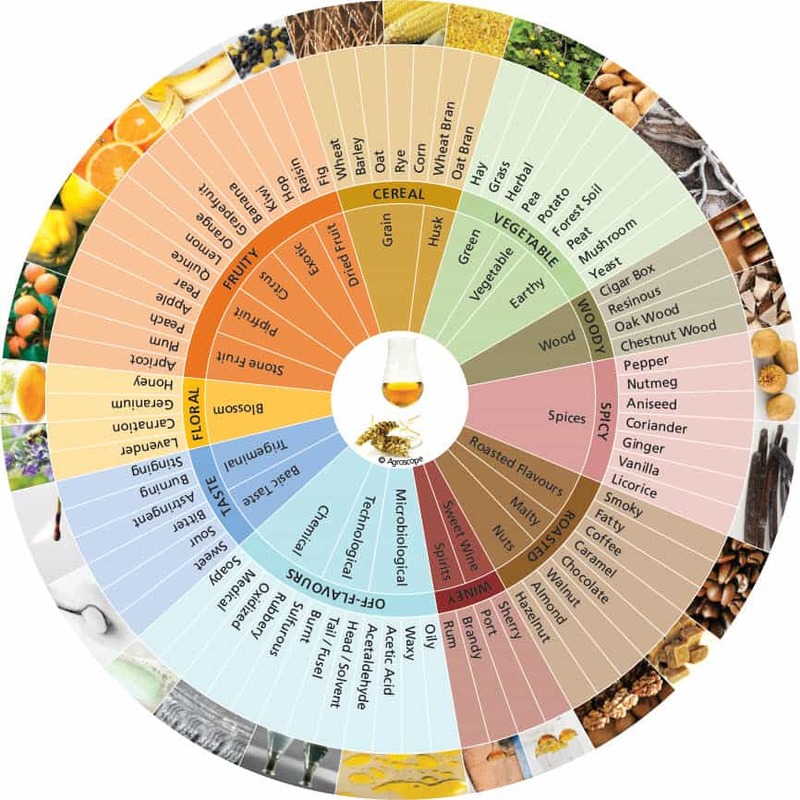 The sections consist of these main areas: Cereal; Fruity or ‘estery’; Floral or ‘aldehydic’; Peaty or called phenolic; Feinty; Sulphury; Woody; and Winey. I won’t labour these parts too much, as you can read more online, and it has actually been developed further. 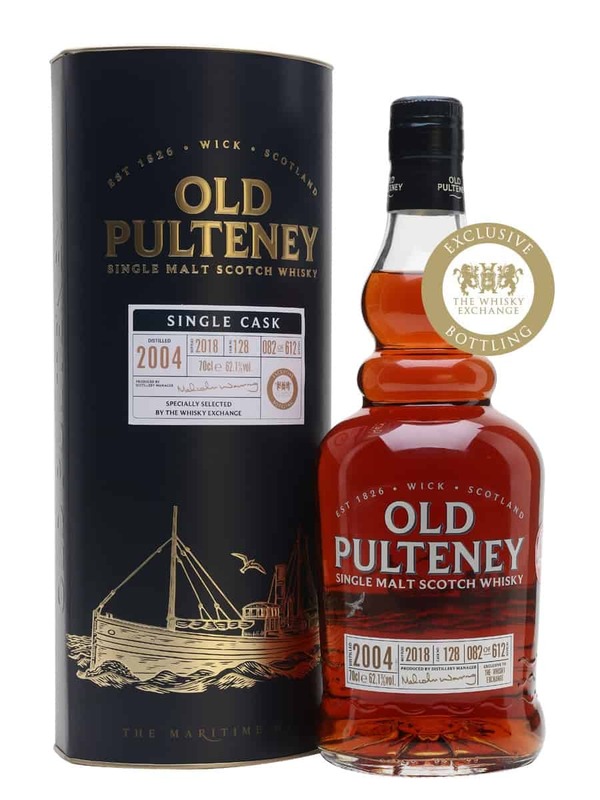 But I find this gives a remarkably good range of flavour groupings, and consequently what sort of compounds may be in the whisky to varying degrees. 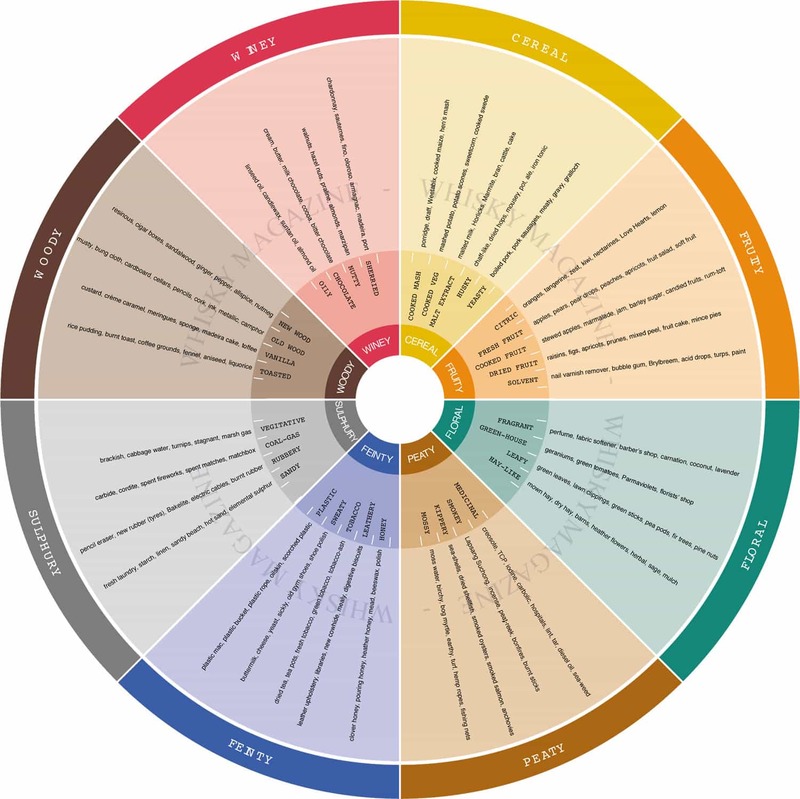 Here’s another variant whisky wheel from Agroscope. Essentially these charts are handy things to consult from time to time, They provide maps for drinkers to navigate the uncharted waters of whisky. Not only do you get an appreciation of the variables – which I think is of great help to newcomers – but they also act as a handy go-to guides for old-timers when they’re struggling to put their finger on a particular flavour within. It’s also just interesting. Now this, clearly, is not whisky. It isn’t even a wheel! But there are some interesting terms that might be a useful reference point for those looking to describe flavours. 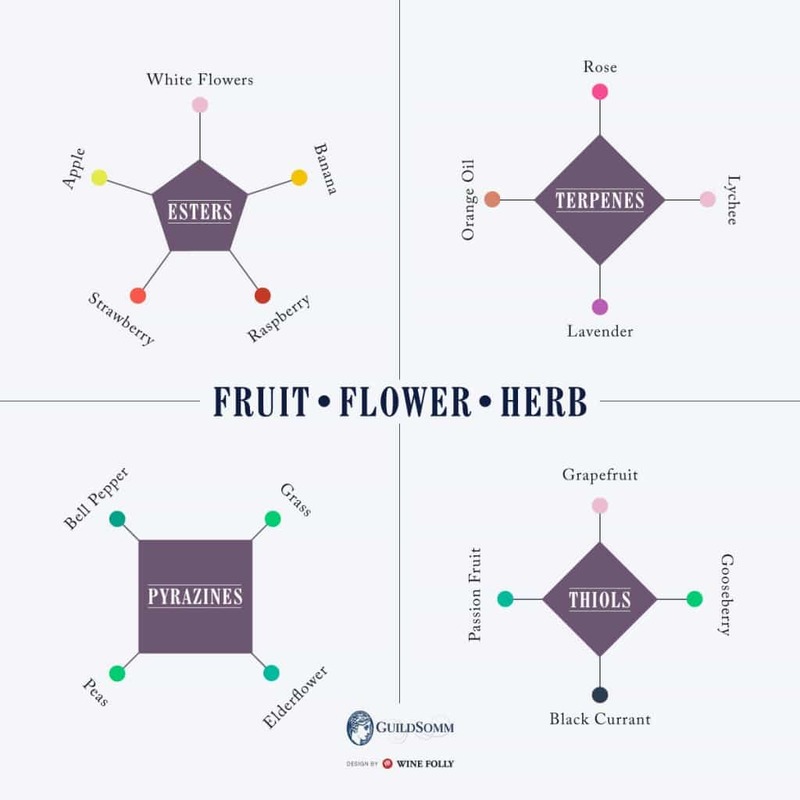 Again, it draws upon what the compounds are within the wine and how that affects what qualities you can taste. A lot of these, and possibly the whisky wheels, are inspired by Ann C. Noble’s original aroma wheel. And there’s even a wine mouth-feel wheel, which shows you how far things have gone in this area of research. Why am I writing about all of this? There was a section in Adam Rogers’ Proof: The Science of Booze, that referenced ‘experts’ tasting alcohol. He said that most experts weren’t really any better at tasting alcohol than general drinkers, but that they tended to develop a greater bank of references over time (and could link these senses with memory) in order to be able to describe those tastes to others. You could say, also, that they had a richer language to draw upon. That’s why these flavour wheels are so brilliant. They are for the most part simply a framework – a starting point for discussion. 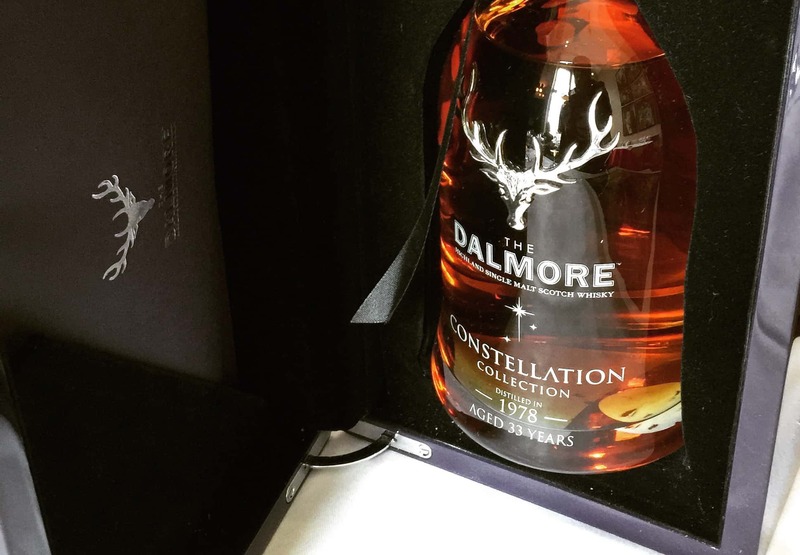 They lay out the foundation for a common language and I figured that, if I could use some of that common language among my own descriptions, then that could make me a more effective communicator of the qualities of a whisky. Anyway, hopefully you’ll find some of these charts and links useful when it comes to appreciating whisky yourself. And if not, then that’s fine too. Are you aware of anywhere that you can order a print of the colour chart? I’d love one hanging in my office for when i taste whisky but i can’t see to find it anywhere in a quality that could be printed! I’m not sure, Chris – you might want to try Whisky Magazine directly, as that’s where it originates. They may have high res versions!